While the Museum prepares for Natsumatsuri on Saturday, August 10th, we thought we’d get everyone pumped by putting a spotlight on some of the upcoming activities! Look forward to more of these posts explaining several Natsumatsuri traditions. Anyone who’s been a regular visitor to Little Tokyo has likely seen—or heard—a taiko group perform. If you haven’t, there will be several chances to at this year’s Natsumatsuri! Museum docent Hal Keimi will be teaching taiko, followed by a performance to cap off the day by the L.A. Matsuri Taiko group. Taiko, or Japanese drums, have grown into a variety of percussion instruments. Taiko can also refer to the art of Japanese ensemble drumming with many different instruments and performers—specifically known as kumi-daiko. Performances can last from five to 25 minutes. 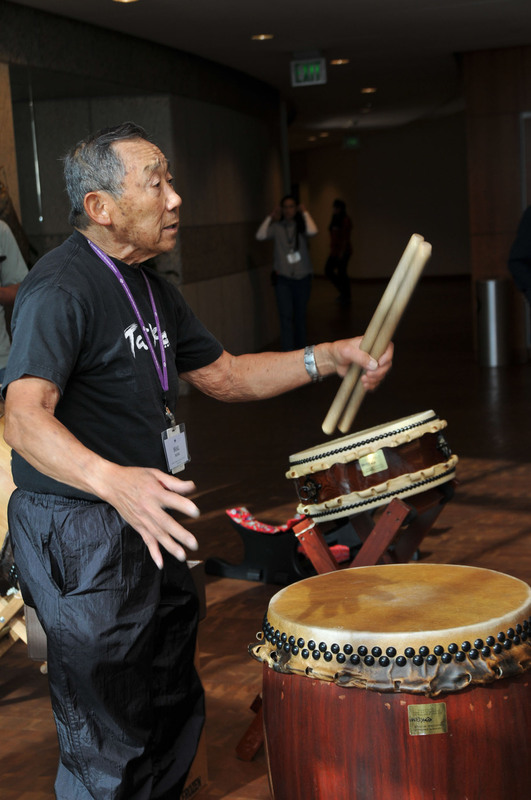 Taiko in America really began in the 1960s, when the first kumi-daiko group was formed in San Francisco. That first group soon lead to two more, one in San Jose and the other right here in Los Angeles. These three original groups built their own drums, created their own costumes, and wrote their own music. The ranks swelled and diversified to over 250 groups in North America today, who perform not just at festivals but also in colleges, auditoriums, and movie soundtracks. Check out this video of LA Matsuri Taiko performing at the Valley Japanese Community Center Obon Festival! Enjoy a fun taiko performance by L.A. Matsuri Taiko!